MANHATTAN — The 11-story 31-unit boutique condo called 15 Renwick, rising in Hudson Square, will include only three parking spots in its 1,000-square-foot garage. It will have a remote-controlled gate and direct access to the lobby, providing what many of the city's elite covet: privacy. The three parking spots are expected to soon hit the market for $1 million apiece, according to Dan Oelsner, vice president of development for IGI-USA, which is constructing the project. The spots, which will be listed at the same time as the project's $7.15 million penthouses and $3.5 million townhouse units, were limited because of zoning and architectural considerations, Oelsner noted. "This type of amenity is very unique for a new development in this neighborhood," Oelsner said. With the number of parking garages disappearing in Manhattan — often to make way for new luxury developments — and while the number of parking spaces a developer is allowed to include remains limited — usually to 20 percent of the number of residential units — a private parking spot is becoming the ultimate status symbol. Many developers are also banking on the next best thing: a porte-cochère, which allows you drive into your building and get out of your car unseen by the masses while a valet parks it for you somewhere nearby. "The city is obviously trying to discourage automobile traffic in Manhattan," said Richard Cantor, of Cantor-Pecorella, an agency handling sales and marketing for several new buildings with high-end garage amenities. "[Parking] is probably the most important amenity you can have in Manhattan today. People are willing to pay for it," he added. Car ownership rates in Manhattan, south of 96th Street, tend to be lower than the citywide average. Twenty-two percent of households in this part of Manhattan own cars compared to 46 percent in the city as a whole. But many of the new luxury buildings in development in the area have sprawling apartments that cater to families who often own cars. Meanwhile, Manhattan, south of 96th Street, saw a decrease of roughly 25,000 off-street public parking spots from 1978 to 2010, according to a Department of City Planning study. The remaining 102,000 spots cited in the report have been dwindling as garages make way for these new luxury high-rises. Garages tend to be prime development sites since they are often not landmarked and can be delivered quickly because there are no tenants who would be displaced, explained Cantor. His firm is marketing 12 East 13th St. in the Village, where eight luxury units are rising in place of a Hertz garage that had been in the location since the 1930s. And because it was previously a garage, the building can have second-floor parking spots, which frees up the ground-level real estate for income-generating uses like retail, he noted. It will be the first building in Manhattan to use the latest version of a robotic parking system by Park Plus, which will automatically retrieve a buyer's car in about 60 seconds, according to building reps.
"It's the parking of the future. You call your car on your iPhone and it's brought down to the first floor and you can slide right out. "Buyers have responded to this amenity," Cantor said. "In the Village, this is particularly important because there's almost no [on-street] parking — you have to move your car and go through the whole [alternate side] dance." Cantor's firm is also working on 443 Greenwich, a 53-unit building that has a stately looking garage that features a porte-cochère entrance with white Gustavino-tiled ceilings and a terracotta-tiled floor. For residents who don't purchase a parking spot, a valet will park their cars in nearby TriBeCa garages. "What we created at 443 Greenwich satisfies both a need for privacy, particularly for celebrity buyers, and offers convenience as well since we created a private area where you can park your car and leave it there for several hours — do whatever you need to do — and no one sees you on the street." At Chelsea's 551W21, the inclusion of a private motor court with valet parking (in addition to parking for between 30 to 53 spots, many with electric charging stations, the prices of which are to be determined) was seen as a "major component" of the building's inspiration: "the white-glove services of a bygone era," said Erin Boisson Aries, senior managing director of sales at the building. The court has a 30-foot-tall green wall with lush climbing ivy that will change color with the seasons. The space is intended not only to provide privacy to residents of the 44-unit building where apartments will cost between $7.25 million to $40 million, but "also a sense of comfort, discretion and distinctiveness," Aries said. 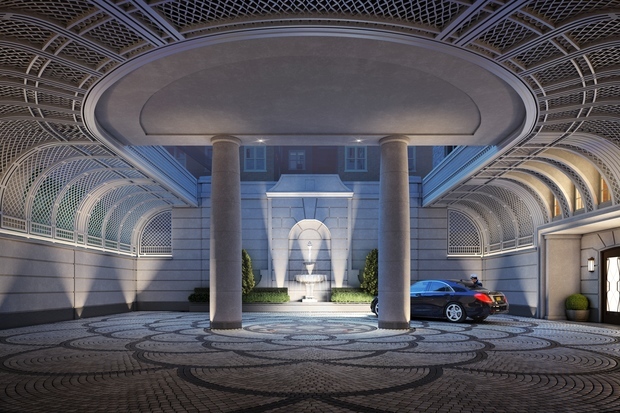 There are no parking spots at 20 East End Ave., on the Upper East Side, but there is a grand gated motor court accessed through a 20-foot-tall arched opening of the building into a cobblestoned area with a fountain and room for eight cars. Its design pays homage to the eloquent buildings like the Dakota and Apthorp and will be joining the ranks as one of only five such buildings with a true porte-cochère motor court — the first to be built in 80 years, said Nicole Siciliano-Trazzera, sales director for the project. Siciliano-Trazzera noted that the project, like others with high-end garage amenities, is targeting sales on families that will make these units their primary residence (even if they have other homes) rather than on investors. Units are asking between $4.5 million to more than $35 million. Families will be able to drive into the 43-unit building to unload their kids and luggage in privacy and then have an on-staff runner park it at one of the two garages flanking the building, she added. "You can live a normal life without having to live in the suburbs," she said, adding, "You never have see the inside of a garage ever."